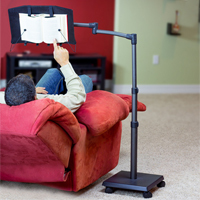 The LEVO G2 Book Holder Floor Stand allows users to position books whether the reader is lying down, reclined, seated or standing up. It can be used to read in bed or on the couch, while working out, or while performing household tasks. The LEVO G2 Book Holder Floor Stand has a weighted base (with casters) that can accommmodate books weighing up to four pounds.